Pours black, small grey head. Smell is sweet, bit spices, ( curry pops in mind, which is very weird ) very mild roasted malts. Taste is weak, minor roasted malts. Sweet, a bit of that curry character. Low carbo. Mild oxidation. very easy drinkable ! 25cl Flasche. Schwarze Farbe, flacher cremiger Schaum. Dickflüssiges Bier. Vanille, Schokolade und Kaffe in Nase und Mund. English-style sweet stout since long made by Interbrew, now AB InBev; also available in cans but I haven’t seen it in a while, not sure if it is still produced after the fusion with Anbev. 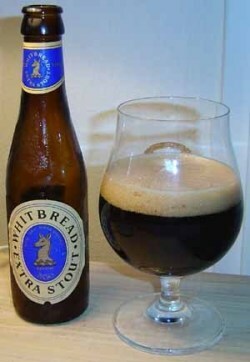 Beige head, near black colour, primarily caramelly and chocolatey malts character, some liquorice, light roasted bitterness in the finish but overall (too) sweet and even sugary. An old fashioned style which is facing extinction in Belgium, but in all this is / was a fairly decent example. Amazingly drinkable for a 2 decade old 5% stout. Tastes a lot like a chocolate malted milk. Full and creamy, no carb obviously. Cap was rusted. Has some plastic flavor as well. Roast is minimal. Completely black with a small, bubbly, beige head. Aroma has liqourice, say sauce, roasted, nuts. Low carbonation, dry and slightly watery mouthfeel. Flavour is elegant and amazingly preserved. Milky chocolate, peanuts, malty dry and bitter. Light roasted, but generally just very elegantly sweet. A Mes rate. Bottle from 1989 at DHVL. Totally black and still holding on to and amazing tan head, especially considering it’s 20 years old. Bags of flavour and character. I really wasn’t expecting this. Brimming with coffee and chocolate along with a faint sourness that really balances it all out plus a hint of lactose. Silky smooth, and dare I say it, bloody excellent. 1990 bottle: Black with a small off-white head. Vineous aroma with dried fruit and port wine, and some chocolate underneath. Sweetish fruity flavour with chocolate. February 2008. Stout with quite a bit of carbonation. A little, sweet subtle chocolate. Smooth, slighty creamy and with a trace of smoke.